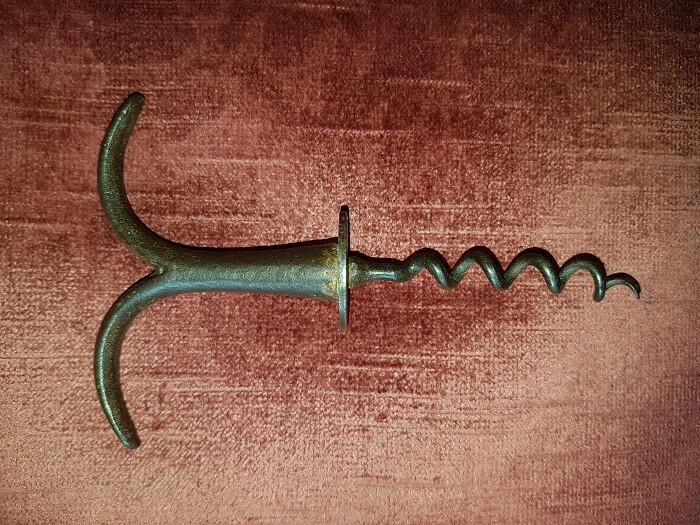 Rare 19th Century Henshall Type Eyebrow Easer with plain button, wire worm corkscrew. Length 4 1/2" , button 31/32" Dia., eyebrow width 3", Lenth of worm 2 9/16"
Traces of original Bronze Paint. Original wire worm with some distortion. Tip of worm original. General signs of ware. Note: It is likely I will be away for 8 days in November and as I only deal with any sales this could delay shipment. Uk Customers please pay by Cheque preferred or Paypal. Goods will be sent as soon as Cheque cleared. Usually 5 days after cheque banked. Overseas Customers Please pay by Paypal. No other options available. Note that your homeland Customs and Handling costs are your responsibility and are not charged for in the Shipping cost shown below.